Getting a head start on Christmas presents and ornaments is a very smart idea. It helps you not stress too much during the holiday season and allows you to enjoy all the benefits of Christmas and winter. Think of all the presents you can stitch up if you start early! The ornaments below are just a few of the best patterns out there. They range from fun and whimsical to more traditional. Whatever your style is, have fun stitching! Lizzie Kate's Sledding Dudes pattern is not only clever but also fits almost anyone's style for Christmas. These patterns are so adorable. This is just one of the many patterns that go along with the sleds. You can purchas a more traditional pattern and sleds from The Silver Needle. A side note, If you want excellent customer service please order from them. Their customer service, packaging and product is above almost anything I have encountered in a long time. The piece is stitched on perforated brown paper, but you could really stitch it on anything you like and attach it to the sled. Believe it or not, this is an excellent way to teach someone to cross stitch because of the perforated paper. You can purchase this pattern as well as other sled patterns and the sleds HERE. 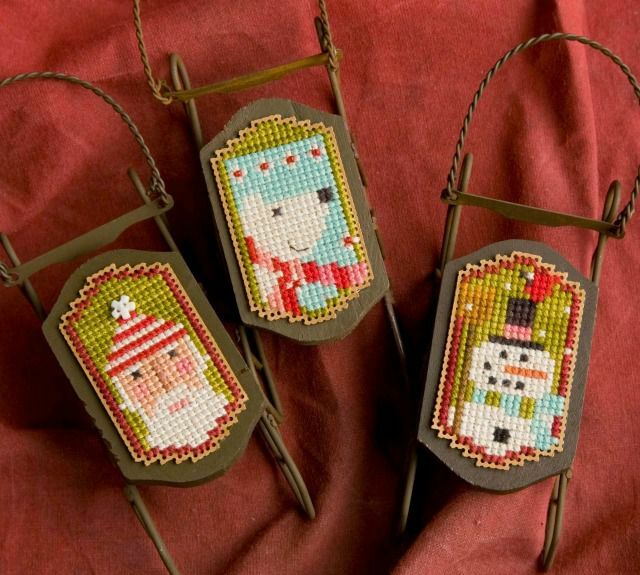 This pattern from Stickeules includes three snowballs but don't you think it would be absolutely beautiful to separate them out and stitch them up individually. They would look stunning in white with hints of metallic thread or each ball in different colors. If you decided to stitch them separately you can also use the pattern for cards. Together theses ornaments would be beautiful as a sampler or in a hoop. You can also use any color of floss and fabric to fit your decor. This is one pattern that can be used in both traditional and whimsical houses. You can find the pattern, as well as others for free HERE. You will have to scroll down the page to find the pattern. Do you have a sweet tooth that is more like sweet teeth? Is it hard not to pass up a candy store. If you know someone who is candy crazy than this ornament is the perfect tree trimming gift. Using a flexible canvas, each piece is stitched and then cinched together to make the cutest little ribbon candy out there. Best part...no calories. You can purchase a kit from Everything Cross Stitch on their website. If you are feeling extra adventurous, try your own patterns and shapes. This is such a clever play on the traditional Christmas candy and you can pick any color you like that matches your decor. Sometimes we get caught up in the glitz of Christmas. It is nice to take a step back to a more simple time and space. Our Pioneer Homestead shares patterns and a tutorial for primitive Christmas ornaments/tags. These ornaments are a great quick project for those last minute ideas. Each pattern beckons us to remember that the holiday season is about family, joy and slowing down to appreciate the people that are important in our lives. You can also find other primitive patterns on Etsy. Some favorites are The Little Stitcher and The Primitive Hare. Primitive patterns are not the contemporary traditional but instead reach back to a more simple time. You can use these patterns as ornaments or advent calendars. Whether you are fabulous with a glitzy Christmas or more into a simple hometown holiday, there is a pattern for everyone out there. Grab your needle and floss and create something for someone special today. It will be a gift that they will cherish forever. Each time they look at it, they will be reminded of the love you share with them.Cross stitched ornaments are an excellent way to create one of a kind gifts for a large group of people. Don't wait around until the last minute. Start your stitching now.